Just a few short years ago, consumers could find trans fats in a variety of food products at the grocery store or in restaurants. But after linking the smallest amounts of these acids to cardiovascular disease, many areas of the country set up restrictions to keep them in line. Last month's announcement from federal regulators that they are ending the use of trans fats in food products brought a cheer from health advocates. But how do companies that produce food products plan to cope? Food scientists say the food industry should be able to make a smooth transition away from the substance. On June 16 the Food and Drug Administration (FDA) issued a final determination, removing partially hydrogenated oils (PHO), the primary source of artificial trans fats in processed food, from the “generally recognized as safe” (GRAS) list of human food ingredients. Food manufacturers will have three years to completely phase it out. The FDA said it took the action based on a review of the scientific evidence. There has always been some trans fat in food because small amounts form naturally in meat and dairy products. The natural form is not the issue. Instead, the new regulation is aimed at the artificial trans fats that the food industry has used for decades to keep food from going bad and add to a product's shelf life, both in the supermarket and in consumers' pantries. By adding hydrogen to oils at high temperatures, the process makes the oil more solid and a lot more stable, and in the process forms what we call trans fat. “The trans fat, also known as partially hydrogenated oils, are used in a lot of formulations and actually give the food product a little better texture and better taste," Aramouni said. As a result, food manufacturers began using trans fat in more and more processed foods like baked goods, frozen foods, and snack foods. Then, in the 1990s, clinical studies began to show that trans fat raises the "bad" LDL cholesterol and lowers the "good" HDL cholesterol in blood, thereby increasing the risk of heart disease. Subsequent research found that trans fat also stiffens arteries and may increase the risk of diabetes. While food companies now have three years to remove trans fat from their products, Aramouni says most companies have already made the adjustment. In other words, the food you buy today doesn't contain much trans fat. The American Bakers Association says its member companies have been dropping trans fat from its products over the last decade. Still, the trade group was pleased the FDA is giving it three years to complete the process. “This action provides bakers and other food makers adequate time to further formulate to other, healthier alternative[s], as well as address a number of practical challenges including packaging changes and availability,” the group said in a statement. Food companies are still adding oil to their products, but many of the types now in use are stable without having trans fat in them. Some companies started using unsaturated fats or natural oils again, incorporating antioxidants to help maintain the shelf life. As a result, Aramouni says he doesn't think the ban will be much of a problem for the food industry, since most companies have already made the transition. At the same time, he says consumers should be aware of what they're getting. Under current nutrition labeling regulations, a product containing less than half a gram of trans fat can claim zero trans fat in the product. That requires a closer reading of product labels. Aramouni says consumers need to read the ingredients list, which requires the food to list any partially hydrogenated oils it contains. Trans fats contribute to harmful cholesterol buildup and heart disease. Official U.S. government dietary guidelines recommend next to zero consumption of trans fats. McDonald's has been trying to rebuild confidence in its menu after repeated criticism of its menu choices and cooking methods. The "worst restaurant meal in America?" Just how bad does a restaurant meal have to be to be named "Worst Restaurant Meal in America?" And, it gets worse, the consumer group says. On top of that, the meal has another 19 grams of saturated fat, which also promotes heart disease, and nearly 3,700 milligrams of sodium, which is tied to high blood pressure and stroke. While other fast-food meals have more calories than the Big Catch's 1,320, it's the artery-clogging fat that gives the Big Catch the title. "Long John Silver's Big Catch meal deserves to be buried 20,000 leagues under the sea," said CSPI executive director Michael F. Jacobson. "This company is taking perfectly healthy fish -- and entombing it in a thick crust of batter and partially hydrogenated oil. The result? A heart attack on a hook. Instead of the Big Catch, I'd call it America's Deadliest Catch." CSPI researchers say what was most startling was the 33 grams of trans fat in the Big Catch meal, all of which comes from industrially produced partially hydrogenated frying oil. The American Heart Association recommends that people limit themselves to about two grams of trans fat per day -- or about as much as one might consume from naturally occurring trans fat in milk and meat. That means Long John Silver's Big Catch meal with onion rings has 16 times as much trans fat as the heart association recommends -- more than two weeks' worth. Most major chains have stopped using partially hydrogenated oil altogether, in response to bad publicity, lawsuits, and local government restrictions on its use. In 2006, before KFC stopped using partially hydrogenated oil to fry its chicken, the worst meal on the its menu had 15 grams of trans fat -- less than half the trans fat in the Big Catch with Onion Rings. "Trans fat from partially hydrogenated oil is a uniquely damaging substance that raises your bad cholesterol, lowers your good cholesterol, and harms the cells that line your blood vessels," said Walter C. Willett, chair of the nutrition department at the Harvard School of Public Health. "It might have been defensible to use hydrogenated oil in the 1980s, before trans fat's harmfulness was discovered, but no longer. It is outrageous that Long John Silver's foods are still loaded with artificial trans fat and that the FDA still permits it in foods." CSPI has formally notified Long John Silver's CEO Mike Kern it will sue the chain if it continues to use partially hydrogenated oil in its deep fryers. Making its fried foods virtually trans-fat free should be easy to do, CSPI claims, since by law, Long John Silver's outlets in California and certain other jurisdictions must limit artificial trans fat to half a gram per serving. CSPI researchers telephoned multiple Long John Silver’s restaurants in California, and all of them said they used canola oil in their deep-fryers, and not the partially hydrogenated soybean oil used in much of the rest of the country. Efforts by ConsumerAffairs to reach the Long John Silver’s corporate office for comment were unsuccessful. The FDA wants to do away with trans fat in processed foods, hoping to prevent heart attacks and other heart disease. The agency today issued a finding that partially hydrogenated oils, the primary dietary source of artificial trans fat in processed foods, are not “generally recognized as safe” for use in food. The FDA’s preliminary determination is based on available scientific evidence and the findings of expert scientific panels. Consumption of trans fat raises low-density lipoprotein (LDL), or “bad” cholesterol, increasing the risk of coronary heart disease. The independent Institute of Medicine (IOM) has concluded that trans fat provides no known health benefit and that there is no safe level of consumption of artificial trans fat. Additionally, the IOM recommends that consumption of trans fat should be as low as possible while consuming a nutritionally adequate diet. "Artificial trans fat is a uniquely powerful promoter of heart disease, and today's announcement will hasten its eventual disappearance from the food supply," said Michael F. Jacobson, executive director of the Center for Science in the Public Interest. "Not only is artificial trans fat not safe, it's not remotely necessary. Many companies, large and small, have switched to healthier oils over the past decade. I hope that those restaurants and food manufacturers that still use this harmful ingredient see the writing on the wall and promptly replace it." In recent years, many food manufacturers and retailers have voluntarily decreased trans fat levels in many foods and products they sell. Trans fat can be found in some processed foods, such as certain desserts, microwave popcorn products, frozen pizzas, margarines and coffee creamers. Numerous retailers and manufacturers have already demonstrated that many of these products can be made without trans fat. Though small amounts of trans fat occur in meat fat and milk fat, most of the trans fat in the food supply has come from industrially produced partially hydrogenated oils. Like saturated fat, trans fat raises one's LDL, or "bad" cholesterol, which promotes heart disease. But unlike saturated fat, trans fat lowers one's HDL, or the "good" kind of cholesterol that protects against heart disease. Trans fat may also promote heart disease in other ways, such as by damaging the endothelial cells that line blood vessels. If the FDA finalizes its preliminary determination, PHOs would be considered “food additives” and could not be used in food unless authorized by regulation. Many health-conscious food shoppers often choose products listed with "zero trans fat." But because of the way the law is written, they still may be purchasing items containing some trans fat. And now new research suggests that small amount of trans fat that slips in under the label requirement could be medically significant. Current law requires that fat content of greater than five grams be listed in one gram increments, less than five grams be listed in .5 gram increments, and lower than .5 grams as containing zero grams of fat. Meaning, if a product has .49 grams of trans fat, the label can list the trans fat content as zero. An article by Case Western Reserve University School of Medicine student Eric Brandt, published in the January/February 2011 issue of the American Journal of Health Promotion, reveals that label loophole can result in medically significant intake of harmful trans fat, despite what you read on Food and Drug Administration (FDA) approved labels. Brandt maintains that consumers' inability to identify high-risk foods may cause individuals to exceed the daily recommended value of 1.11 grams of trans fat from processed foods and lead to adverse long-term health side effects. Trans fat consumption has been linked to increased risk of coronary artery disease, diabetes, and sudden cardiac death. Because the daily recommended amount of trans fat from processed foods is only 1.11 grams, one would only need to consume a few "deceptively" labeled trans fat foods to exceed the healthy recommended intake. As few as three of these items would exceed the healthy recommended intake; for example, consuming three serving sizes each with .49 grams of trans fat, totaling 1.47 grams. Despite what seems to be a small amount of trans fat to ingest, Brandt says research shows that increasing daily trans fat consumption from .9 percent to 2.1 percent, or from two grams to 4.67 grams, will increase one's risk of cardiovascular disease by 30 percent. In an effort to adhere to its mission and responsibility in "helping the public get the accurate, science-based information they need to use medicines and foods to maintain and improve their health," Brandt recommends the FDA revise its labeling protocol in order to prevent misleading the public about the amount of trans fat they are consuming. He recommends the FDA require food labels to report trans fat content in smaller increments, enabling consumers to recognize significant levels of trans fat in food products and allow one to properly manage their consumption. The suggested change will increase awareness of accurate food trans fat content, empower informed food choices, and improve public health outcomes. The nonprofit Center for Science in the Public Interest (CSPI) has called on the Food and Drug Administration (FDA) to take enforcement action against companies making misleading trans-fat claims on food labels. CSPI says that any claim of "0 grams trans" on foods high in saturated fat is inherently misleading, since consumers might think such a product is good for one's heart health. Manufacturers such as Sara Lee, Mrs. Smith's, and Nestle misleadingly label several of their products "0 grams trans," even though they have 4 to 11 grams of artery-clogging saturated fat. The FDA considers 4 grams and up to be a high level of saturated fat. "Just because a food doesn't have any trans fat doesn't by itself make it a health food," said CSPI executive director Michael F. Jacobson. "Companies shouldn't foster confusion by making trans-fat claims on foods high in saturated fat, and the FDA shouldn't let them get away with it."  Mrs. Smith's Apple Pie: A prominent red banner over the brand name states "0g trans fat per serving." One serving of the product contains 7 grams of saturated fat.  Mrs. Paul's Crunchy Fish Fillets: A banner stating "0 grams trans fat per serving" appears directly above the brand name. One serving of the product contains 5 grams of saturated fat.  Spectrum: Organic All Vegetable Shortening: A yellow highlighted batter stating "0 grams trans fat" appears on the front label. One serving of the product contains 6 grams of saturated fat.  Nestle Crunch Ice Cream Bars: A banner over the large-print word "Crunch" states that there is "0g trans fat!" One serving of the product contains 11 grams of saturated fat.  Sara Lee Pumpkin Pie: The label states that the product has "zero 0g transfat." One serving of the product contains 4 grams of saturated fat. The FDA currently prohibits food companies from making "saturated fat free" claims for foods that have virtually any trans fat. CSPI says the agency should have a corresponding rule prohibiting "0 grams trans" claims on foods high in saturated fat. Health experts agree that artificial trans fat is among the most harmful substances in food and we're constantly being told we should avoid it. But that's more easily said than done, as a recent survey by the Center for Science in the Public Interest (CSPI) demonstrates. Marie Callender’s pies, Pop Secret’s microwave popcorns, and Long John Silver’s Breaded Clam Strips are among the many products that still contain high levels of artificial trans fat, the nonprofit CSPI said. After the Food and Drug Administration (FDA) required trans fat to be listed on food labels, most large manufacturers removed partially hydrogenated oil, the source of artificial trans fat, from their products. And after a series of lawsuits, bad press and new restrictions, most large restaurant chains similarly stopped using the discredited ingredient. Thus, while many consumers might consider the problem solved, the sad fact is several large companies continue to market products containing unhealthy amounts of trans fat. Marie Callender’s Lattice Apple Pie (ConAgra Foods) contains 5 grams of trans fat per serving. 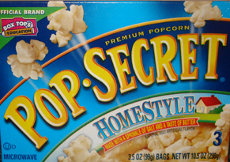 Varieties of Pop Secret microwave popcorn (Diamond Foods) contain 4 or 5 grams of trans fat per serving. An order of Long John Silver’s Breaded Clam Strips contains 7 grams of trans fat. While White Castle recently eliminated trans fat from most of its products, some regionally marketed pastries contain large amounts. White Castle’s doughnuts contain a whopping 8 or 9 grams of trans fat per serving. The American Heart Association recommends that people limit their trans fat intake to no more than two grams per day. Since small amounts of trans fat occur naturally in beef and dairy products, that leaves very little, if any, room for artificial trans fat from partially hydrogenated oil. Celeste’s Original Pizza (Pinnacle Foods Group). In 2004, the Center for Science in the Public Interest filed a regulatory petition urging the FDA to ban the use of partially hydrogenated oil in food altogether. CSPI estimates that companies have eliminated well over half of the partially hydrogenated oil in the food supply. But the remaining trans fat continues to promote heart disease, likely causing thousands of unnecessary premature deaths annually. HHS Secretary Tommy G. Thompson announced today that food labels will be required to list the amount of unhealthy trans fatty acids, or trans fat, to give consumers better information when choosing their foods. The new requirement, issued by HHS' Food and Drug Administration (FDA), will mean that manufacturers of most conventional foods and some dietary supplements will have to list in the Nutrition Facts panel the trans fat content of the product, in addition to the information about its overall fat content and saturated fat content. The additional information will give consumers a more complete picture of fat content in foods -- allowing them to choose foods low in trans fat, saturated fat and cholesterol, all of which are associated with an increased risk of heart disease. Reducing the intake of trans fat and saturated fats is recommended by the federal Dietary Guidelines for Americans. 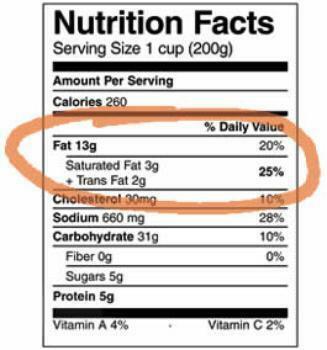 However, while the new labels must state how many grams of trans fat a food contains, they won't put this amount in context by stating what percent of the Recommended Daily Value of trans fat you get from the product. "It will be hard for people to tell if a given number of grams of trans fat is a lot or a little," said Margo Wootan of the Center for Science in the Public Interest, which petitioned the Food and Drug Administration to require trans fat labeling. "Five grams may not seem like a lot, but it is." Nevertheless, Wootan said, the new label will allow consumers to compare trans fat from product to product, "and that will be a great step forward." The label also will spur food companies to reduce trans fat, she said. Under the new FDA regulations, by Jan. 1, 2006, consumers will be able to find trans fat listed on food nutrition labels directly under the line for saturated fat. 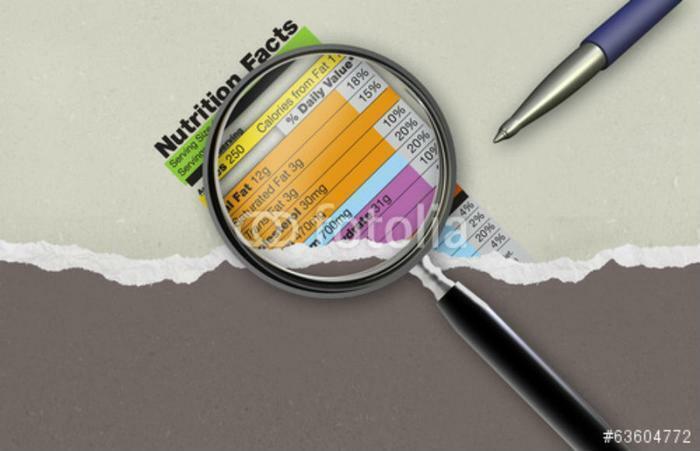 The new information is the first significant change on the Nutrition Facts panel since it was established in 1993. The new labeling reflects scientific evidence showing that consumption of trans fat, saturated fat and dietary cholesterol raises low-density lipoprotein (LDL) cholesterol ("bad" cholesterol) levels that increase the risk of coronary heart disease. Nearly 13 million Americans suffer from coronary heart disease, and more than 500,000 die each year from causes related to coronary heart disease. Trans fat occurs in foods when manufacturers use hydrogenation, a process in which hydrogen is added to vegetable oil in order to turn the oil into a more solid fat. Trans fat is often but not always found in the same foods as saturated fat, such as vegetable shortening, some margarines, crackers, candies, cookies, snack foods, fried foods, baked goods, salad dressings, and other processed foods. "Our choices about our diets are choices about our health, and those choices should be based on the best available scientific information. This label change means that trans fat can no longer lurk, hidden, in our food choices," said Mark B. McClellan, M.D., Ph.D., commissioner of FDA. "Americans will now be armed with better information to reduce their intake of saturated fat, trans fat and cholesterol - which could significantly lower the risk of heart disease, the leading cause of death in America today." By providing more useful information to consumers seeking a healthy diet, the new labels are expected to reduce the costs of illness and disease for Americans. The FDA estimates that the changes in regulations will save between $900 million and $1.8 billion each year in medical costs, lost productivity and pain and suffering. The new label is part of the department's broader efforts to more effectively inform consumers about the health consequences of their dietary choices. The agency hopes to improve the nutrition label to provide clearer, up-to-date guidance on a healthy overall diet. FDA is also working to increase the focus on health in food product development and promotion, as well as encouraging research that would foster greater science-based competition among food producers to improve health. The National Heart, Lung and Blood Institute (NHLBI) at HHS' National Institutes of Health (NIH) supports the new labeling. "Trans fat, like saturated fat and dietary cholesterol, raises LDL "bad" cholesterol levels in the blood, which increases the risk for heart disease," said Dr. Claude Lenfant, director of NHLBI. "It is therefore desirable to have food labels display all the information that can help consumers choose foods low in saturated fat, trans fat and cholesterol as part of a healthy diet." Although some food products already list trans fat on the food label, food manufacturers have until Jan.1, 2006, to add it to the nutrition label. This phase-in period minimizes the need for multiple labeling changes and allows small businesses to use up current label inventories. The FDA will allow manufacturers to implement the change more quickly, and in fact expects many manufacturers to start listing trans fat content soon. In addition, dietary supplement manufacturers will now need to list trans fat, as well as saturated fat and cholesterol, on the Supplement Facts panel when their products contain more than trace amounts (0.5 gram) of trans fat. Examples of dietary supplements that may contain trans fat are energy and nutrition bars. The new requirements are included in final FDA regulations to be published in the Friday, July 11, Federal Register. FDA today also is issuing an advanced notice of proposed rulemaking to solicit information and data that could lead to further changes in nutrition and product labels related to trans fat, saturated fat, and cholesterol. "While giving consumers accurate information about the trans fat content of their foods is an important step forward, we must do more to help consumers improve their nutrition," said Dr. McClellan. "Consequently, we are also giving notice that we intend to take further steps to increase consumer understanding of the importance of limiting consumption of trans fat, saturated fat, and cholesterol in their diet." July 9, 2003 HHS Secretary Tommy G. Thompson announced today that food labels will be required to list the amount of unhealthy trans fatty acids, or trans fat, to give consumers better information when choosing their foods. A new study ties high consumption of trans fat, found mainly in partially hydrogenated vegetable oils and widely used by the food industry, to an increased risk of coronary heart disease. The study by the Harvard School of Public Health provides the strongest association to date between trans fat and heart disease. It found that women in the U.S. with the highest levels of trans fat in their blood had three times the risk of CHD as those with the lowest levels. The study was published online on March 26, 2007, and will appear in the April 10, 2007 print issue of Circulation: Journal of the American Heart Association. "The strength of this study is that the amount of trans fatty acid levels was measured in blood samples from the study population." said senior author Frank Hu, associate professor of nutrition and epidemiology at HSPH. "Because humans cannot synthesize trans fatty acids, the amount of trans fat in red blood cells is an excellent biomarker of trans fat intake." Clinical trials have shown that trans fatty acids increase LDL cholesterol and lower HDL cholesterol, making them the only class of fatty acids, which includes saturated fat, to have this dual effect. HDL (high-density lipoprotein) is considered a "good" cholesterol; LDL (low-density lipoprotein) a "bad" cholesterol. The researchers, led by Hu and lead author Qi Sun, a graduate research assistant at HSPH, set out to test the assumption that higher trans fatty acid levels in erythrocytesred blood cellswere associated with a higher risk of heart disease among U.S. women. Blood samples collected in 1989 and 1990 from 32,826 participants in the Brigham and Women's Hospital-based Nurses' Health Study were examined. During six years of follow-up, 166 cases of CHD were diagnosed and matched with 327 controls for age, smoking status, fasting status and date of blood drawing. After adjusting for age, smoking status and other dietary and lifestyle cardiovascular risk factors, the researchers found that a higher level of trans fatty acids in red blood cells was associated with an elevated risk of CHD. The risk among women in the top quartile of trans fat levels was triple that of the lowest quartile. "Positive associations have been shown in earlier studies based on dietary data provided by the participants, but the use of biomarkers of trans fatty acids is believed to be more reliable than self-reports. This is probably the reason why we see an even stronger association between blood levels of trans fat and risk of CHD in this study," said Sun. "These data provide further justifications for current efforts to remove trans fat from foods and restaurant meals," said Hu. "Trans fat intake in the U.S. is still high. Reducing trans fat intake should remain an important public health priority." Another food retailer says it is enlisting in the battle against trans fats. Starbucks Coffee said that effective immediately, it will stop using the artery-clogging ingredient in its muffins, donuts and other pastries. The trans fat ban will only affect half the chain's U.S. stores in the near term, with the rest of the stores joining the ban later in the year. Trans fats are vegetable oils that have been processed to turn them into solids. They are often used in baked goods, not to enhance taste but to provide texture. Large scale food producers favor them because they are also cheaper. Beginning Wednesday, Starbucks stores in Seattle, San Francisco, Chicago, Los Angeles, San Diego, Boston, New York, Philadelphia, Washington, D.C., and Portland, Oregon, will have zero trans fats in their food. Starbucks joins a growing number of food chains that are bowing to pressure from health advocates to stop using trans fats. Wendy's has switched to a non-hydrogenated oil that will be used in its restaurants. McDonalds has announced no specific date, but is known to be experimenting with alternative oils. All restaurant chains will soon have to come up with alternatives. New York City has approved a ban on trans fats in its 22,000 restaurants and several other large cities are considering such a ban. 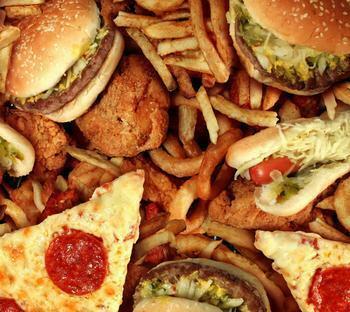 Health advocates have warned for years against eating food with trans fat. They say the re-engineered oils raise LDL, the so-called "bad" cholesterol, and lowers HDL, the "good" cholesterol. Studies have shown that consuming as little five grams of trans fat a day over several years leads to a number of cardiovascular ailments, increasing the liklihood of developing heart disease by 25 percent. While many of America's biggest food manufacturers and supermarket chains are busily replacing trans fats with more healthful substitutes, the biggest restaurant chains are still frying French fries, chicken nuggets, and other fast foods in trans-fat-laden, heart-attack-inducing partially hydrogenated oils, according to a survey conducted by the Center for Science in the Public Interest (CSPI). Trans-fat labeling on packaged foods becomes mandatory on January 1, 2006. That approaching deadline has been a powerful incentive for supermarkets and food manufacturers to switch to healthier oils, but CSPI found that the lack of any nutrition labeling or disclosure requirements for restaurant chains has caused them to lag far behind. • California Pizza Kitchen has removed trans fat from deep-fried foods and is working on eliminating it from all other foods. Last year, Ruby Tuesday, with some 700 table-service restaurants around the country, began deep-frying in heart-healthy canola oil, though its suppliers still par-fry some items in partially hydrogenated oil. Chik-fil-A fries in peanut oil in its outlets, though its suppliers also par-fry French fries in partially hydrogenated oil. Among companies that responded to CSPI, Starbucks, ice-cream chain Friendly, and fried-chicken chain Popeyes indicated they had no plans to remove or reduce trans fat in their foods. In 2002, McDonald's famously promised to reduce and ultimately eliminate the trans fat in its cooking oil, but in 2003 it quietly retreated from its pledge. McDonald's settled a lawsuit against it on the matter by giving $7 million to the American Heart Association and by promising to spend more money informing its customers about the "delay." Although McDonald's has reformulated Chicken McNuggets and a few other products to have a little less trans fat, its fried foods are still very high in trans fats overall. A meal including a 5-piece Chicken Selects and a medium order of French fries has about 9.5 grams of trans fat -- five days' worth of trans fat if one were following the recommendations of the government's Dietary Guidelines Advisory Committee. McDonald's outlets in Australia, Denmark, and Israel all fry in trans-free oil. Meals at other restaurants also are loaded with trans fat. KFC's Chicken Pot Pie contains 14 grams of trans, and Taco Bell's Nachos BellGrande has seven grams. "Selling food cooked in or with partially hydrogenated oils is like selling a car without seat belts," said CSPI executive director Michael F. Jacobson. "Partially hydrogenated oil causes thousands of avoidable premature deaths, and the restaurant industry's reluctance to change is absolutely reckless." • McCain now uses canola oil for all of its grocery and retail frozen potatoes and one line of its food-service French fries. Supermarket chains are also making progress, according to CSPI. Whole Foods has never sold foods with partially hydrogenated oil, and nine of 11 chains that responded to CSPI's queries say they have already made changes or plan to do so for their store-brand products. Wegman's has been making gradual changes for years; the Raley's and Giant chains have asked suppliers to make changes and have switched to trans-free McCain for store-brand frozen French-fries. "Including trans fat on food labels has had a much greater positive effect that most people imagined," said Jacobson. "Nevertheless, the federal government should do what several Denmark has done, and actually require companies, including restaurants, to send partially hydrogenated oils down the garbage disposal of history." Denmark limits trans fat to 2 percent of the fat or oil content of foods. Although small amounts of trans fat occur in meat and dairy foods, 80 percent of trans fat in the diet comes from partially hydrogenated oils. Trans fat is the most harmful of fats in the food supply, since it both raises LDL, or "bad" cholesterol, and lowers HDL, or "good" cholesterol. Dr. Walter C. Willett, professor of nutrition and epidemiology at the Harvard School of Public Health, and his colleagues estimate that trans fat in food causes at least 30,000 premature deaths in the U.S. each year. Although CSPI has been aggressively urging food companies to eliminate partially hydrogenated oils, the group does not want companies to switch to palm oil. That oil is generally produced in Indonesia and Malaysia, where oil palm plantations have replaced rainforest teeming with orangutans, tigers, and other endangered species. Moreover, it promotes heart disease, though not to the same extent as the typical partially hydrogenated oil. CSPI's survey included 38 major food manufacturers, 100 restaurant chains, and 25 supermarket chains. Many popular vegetable oil spreads that boast of "0 grams trans fat" on their labels actually contain significant levels of trans, according to laboratory analyses commissioned by the nonprofit Center for Science in the Public Interest (CSPI). It's perfectly legal, since the Food and Drug Administration (FDA) lets food manufacturers claim zero grams of trans fat as long as the product has less than half a gram per serving. Eat a few servings of these and other ostensibly trans-free products each day and, without even knowing it, you might end up consuming considerably more trans fat than you should, according to CSPI. "Food companies should be weaning themselves off of partially hydrogenated oil altogether, and not sneaking it into vegetable oil spreads advertised as trans-fat-free," said CSPI executive director Michael F. Jacobson. "In the meantime, consumers should seek out products that don't make use of this discredited ingredient, particularly if they're concerned about reducing their risk of heart disease." All of the trans-free claims that CSPI analyzed would be illegal in Canada. Canada prohibits companies from making those claims on products that have more than 0.2 grams of trans fat. While 0.2 is still not zero, it would be more protective of consumers' hearts and arteries, according to CSPI. The CSPI study provides the first publicly available information on just how much trans fat is present in foods that list 0g, but that contain partially hydrogenated oil. The amounts might have been as little as 0.01 or 0.05 grams, truly trivial amounts, but the foods analyzed contained much more. The federal Dietary Guidelines Advisory Committee recommends that Americans consume less than 1 percent of their calories from trans fat. For someone on a typical 2,000-calorie diet, that works out to about 2 grams of trans, or about as much as the average consumer would get from the trans fat that occurs naturally in milk and meat. "Getting trans fat on Nutrition Facts labels was a major advance for consumers' health, but zero grams should really mean zero, or at least something a lot closer to zero," said Dr. Carlos A. Camargo, Associate Professor of Medicine and Epidemiology at Harvard Medical School, and member of the 2004 Dietary Guidelines Advisory Committee. "These amounts of trans fat may seem small, but they can quickly add up to more than what people should consume in a day." In a move that significantly reduces trans fatty acids (TFAs) on its menu, Wendy's is making the switch to non-hydrogenated cooking oil for its French fries and breaded chicken items. The oil has zero grams of trans fat per serving. Wendy's announced that its 6,300 U.S. and Canadian restaurants are scheduled to switch to the new blend of corn and soy oil beginning in August. The Center for Science in the Public Interest (CSPI), a frequent critic of the fast food industry, applauded the move. "Quite simply, Wendy's removal of artery-clogging partially hydrogenated oils from its deep-fryers will make its French fries and fried chicken healthier than similar foods at McDonald's, Burger King, KFC, and other competitors," said CSPI Executive Director Michael F. Jacobson. "Wendy's deserves enormous credit for breaking the trans-fat log jam in the restaurant world. Its action proves that other restaurants, big or small, have no excuse for continuing to impair their customers' health by using partially hydrogenated oil. Indeed, chains whose fare is loaded with trans fat are at risk of being sued for marketing unnecessarily harmful foods and not warning patrons of the risk," Jacobson said. Wendy's breaded chicken sandwiches, nuggets and strips will have zero grams of trans fat. Depending on the serving size, trans fats in French fry offerings will range from zero to 0.5 grams. Kids' Meal nuggets and fries will have zero grams of trans fat. Wendy's also is working directly with its French fry suppliers to further reduce trans fats that occur as part of the par frying process at their facilities, with a goal of zero grams. "This is the right thing to do," said Kerrii Anderson, Wendy's interim chief executive officer. "We're proud of our legacy of innovation in the restaurant industry, and these latest steps that enhance the nutritional profile of our food. We're the first national hamburger chain cooking with non-hydrogenated oil in the U.S."
The 2005 Dietary Guidelines for Americans recommend that individuals substitute mono and polyunsaturated fats for saturated fats, and consume as little trans fat as possible as part of a healthful diet. Jacobson called on the Food and Drug Administration (FDA) to require other restaurants to follow Wendy's lead. "To solve the trans-fat problem once and for all, the Food and Drug Administration, that sleeping watchdog, needs to act. The FDA has ignored CSPI's 2004 petitions calling for disclosure of trans fat in restaurants and a virtual ban of partially hydrogenated oil," he said. The words healthy and donuts dont exactly belong in the same sentence, but executives at the Dunkin' Donuts say they plan to make their food healthier by no longer using trans fatty acids. The company said it hopes to offer a completely trans-fat-free menu by October 15. Even the donuts will be free of the artery-clogging cooking oil. It's not as though Dunkin' had a lot of choice. Since New York City banned trans fat last December, fast-food chains have been scramling to reformulate their recipes. KFC, Wendy's, Burger King and Starbucks have already eliminated some or all of the trans fat from their dishes. Hotels and upscale eateries are doing the same. It's not much ado about nothing. A recent study by the Harvard School of Public Health confirms the risk, providing the strongest association to date between trans fat and heart disease. It found that women in the U.S. with the highest levels of trans fat in their blood had three times the risk of CHD as those with the lowest levels. Dunkin' said doughnuts with zero grams trans fat are currently being served in Philadelphia and New York City. To date, the zero-grams-trans-fat doughnuts have been served in approximately 400 restaurants throughout the country, the company says, as part of a nationwide blind test over a period of four months. We applaud the Dunkin' Brands Research & Development and Supply Chain teams, who have worked behind the scenes for nearly four years to move toward an entirely zero grams trans fat menu," said Joe Scafido, Chief Creative and Innovation Officer at Dunkin' Brands. We are proud to be the first major quick service restaurant chain to introduce a doughnut that has zero grams trans fat. Attack of the 'Zombie' Trans Fat! Artificial trans fat is not dead -- not completely anyway. The Center for Science in the Public Interest (CSPI) says the heart-stopping substance has come staggering "zombie-like out of the culinary graveyard" and points out that Bob Evans, White Castle, and Long John Silver's are all still using artificial trans fat in French fries, onion rings, hotcakes, and other foods. The largest fast-food chains have dropped the powerful promoter of heart disease; it has been forced out of restaurants in New York City, California, and other jurisdictions; and has been increasingly hard to find in supermarkets since trans fat labeling went into effect in 2006. But while McDonald's, Burger King, Wendy's, Starbucks, and other big chains have phased out their use of partially hydrogenated oil (the source of artificial trans fat), CSPI says other America's chain-restaurants have yet to get the memo. "Bob Evans, White Castle, and Long John Silver's are now the roguish outliers among the restaurant industry," said CSPI executive director Michael F. Jacobson. "Many Americans might have thought that the era of artificial trans fat was over. At these chains, it lives tragically on." The three chains, with total sales of $3 billion a year, range between the 39th- and 51st-biggest in the country. Trans fat promotes heart disease by raising one's LDL, or "bad" cholesterol, which clogs arteries, while lowering one's HDL, the "good" cholesterol that guards against heart attacks. The Institute of Medicine recommends consuming as little trans fat as possible, while still eating a healthy diet, and the American Heart Association advises people to limit trans fat to no more than 2 grams per day. Since small amounts of trans fat occur naturally in milk and beef, that doesn't leave much room for trans fat from artificial sources, according to CSPI. At Bob Evans, the fries aren't the problem; it's the pancakes: An order of Stacked & Stuffed Caramel Banana Pecan Hotcakes has seven grams of trans fat; a standard order of three unadorned Bob Evans Buttermilk Hotcakes has nine grams. At White Castle, even Harold and Kumar might look askance at the French fries, onion chips, and onion rings, which have between two and 10 grams of trans fat per order, depending on the product and the size, says CSPI. 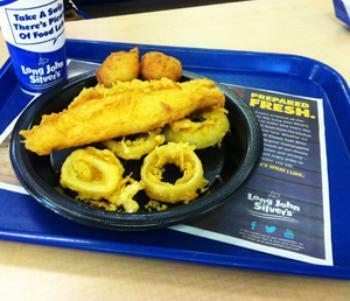 CSPI said it was particularly disappointed to find that trans fat still lurks at Long John Silver's. That chain, owned by Yum! Brands, the parent company of KFC, Taco Bell, and Pizza Hut, knows better, according to the group. KFC phased trans fat out of its fried foods in 2006, four months after CSPI filed a lawsuit against the chain. Taco Bell also phased out artificial trans fat several years ago. Nevertheless, at LJS, battered fish and shrimp has between 2.5 and 4.5 grams of trans fat; a side order of cryptic "Crumblies" has four grams; and every single meal on the chain's Dollar Stretcher menu has artificial trans fat, ranging from the Small Golden Fries (2.5 grams) to the Two Jr. Fish and Fries (seven grams), CSPI charges. "The FDA has all the scientific evidence and legal authority it needs to send partially hydrogenated oil to the chemical boneyard quickly and permanently, but it has failed to do so," Jacobson said. "Banning it would save thousands of lives annually." Fried chicken restaurant chain KFC has announced it will immediately stop using trans fats to fry its chicken. The chain says potato wedges will also be fat free, while several other menu items will continue to use the artery clogging oil. Company officials said biscuits, pot pies, macaroni and cheese, and some desserts will continue to be made with trans fats, at least for now. The company said it's still working to remove all trans fat from its entire menu. Taco Bell, like KFC owed by Yum Brands, also announced that all its U.S. restaurants have switched to an oil with zero grams of trans fat. All 4 200 single-brand Taco Bells were converted to a canola oil, and all 1,400 multibrand locations switched to a soybean oil. Both the Food and Drug Administration and American Heart Association recommend limiting trans fat intake. New York City has set a deadline for all 26,000 restaurants operating in the city to stop using trans fats. Other cities are considering similar bans.